The Photoshop Elements Organizer is a powerful tool that helps you locate files and keeps your photos arranged and organized. You can access the Organizer in Windows by clicking the Organizer button on the menu bar while you’re in one of the editing modes. Or when you open the Welcome screen, click the Organize button. The default Organizer view is like a slide sorter, and this view is one you’re likely to use in all your Elements work sessions. 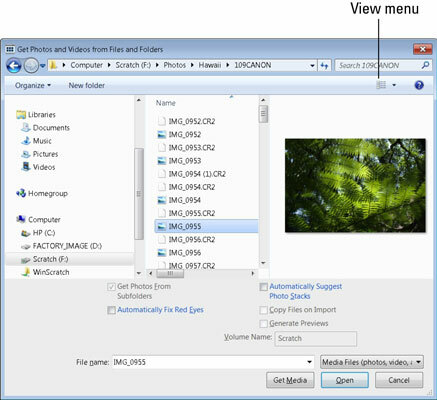 The Organizer provides an efficient means to access the photos you want to open in one of the editors. Just double-click a photo in the Organizer, and you see the image zoom in size to fill an Organizer window. In the Organizer, choose File→Get Photos and Videos→From Files and Folders. The Get Photos and Videos from Files and Folders dialog box opens. From the View menu, choose Large icons (or Medium icons). Select files to add to the Organizer window. Click a thumbnail and use either the Shift key or the Ctrl key (cmd on the Macintosh) to select additional photos. When you hold down Shift and click, all photos between the first thumbnail and the thumbnail you Shift-click are selected. When you Ctrl-click (cmd-click on the Macintosh), you can select/deselect noncontiguous photos. Click Get Media to add the selected photos to the Organizer window. To view all photos (new and old), click the Back button in the upper-left corner. The photos you add to the Organizer may appear out of order when you’re viewing them in the Organizer. Depending on the sort order, the additional photos you add to the Organizer can appear before or after, or integrated within, the original photos. Use the scroll bar in the Organizer to view the added photos.